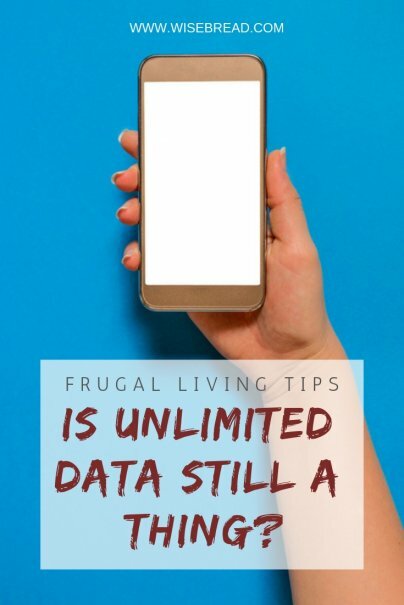 Home » Frugal Living » Budgeting » Is Unlimited Data Still a Thing? Once upon a time, there were affordable unlimited data plans that allowed you to use all the data your heart desired. Nowadays, those plans seem like something out of a fairy tale. So, whatever happened to unlimited data, and what are the best options you can find today? What Happened to Unlimited Data Plans? Let's be honest; you use more smartphone data now than you did five years ago, right? We all do, and the carriers just can't keep up with our increased demands. According to Lowell McAdam, Verizon's CEO, "If you allow unlimited usage, you just run out of gas." He says that unlimited plans just aren't sustainable in today's age of online videos and increased data usage. In short, carriers just don't have the spectrum required to carry the signals anymore. Verizon claimed that there were customers that were using over 100GB of data per month, which may be one of the reasons that they did away with the unlimited data plan altogether. Unless you are grandfathered into a plan with Verizon or AT&T, these carriers no longer offer unlimited data plans to new customers. For several years, Sprint and T-Mobile were the only carriers offering unlimited data to new customers. In the past several weeks, both AT&T and Verizon have re-entered the unlimited data game. One thing that many unlimited data customers don't realize is that while you may have an unlimited data allowance, you won't necessarily receive high-speed data at all times. For instance, if your plan says "Unlimited data (up to 23GB LTE)," this means that you will only have 23GB of fast speed data. After that point, you will receive slower data speeds. Then, once the next cycle starts, you'll be back up to the highest speed. Most of the major carriers cap high-speed data at around 23GB per month. Is Unlimited Actually a Good Deal? Verizon found that the average customer actually only uses between 1-2GB of data per month, so it's important that you figure out exactly what you need before signing onto a plan with too little or too much data. Once you know how much data you realistically need each month, you can actually save money on your monthly plans. For instance, Verizon offers a plan for $50/month for 4GB of data. Even if you were grandfathered into the unlimited data plan, you'd still be spending $100. If you don't use more than 4GB of data, then you can save $35 per month just by switching to the 4GB plan. To find your data usage, go to Settings>Cellular on an iPhone, or Settings>Data Usage on an Android. Once you have this information, you can focus on finding the best cellphone plan for your requirements.